Dec. 19, 2012 | LITTLE ROCK – Endocrinologist Peter Goulden, M.D., has joined the University of Arkansas for Medical Sciences (UAMS) as director of its Diabetes Program and sees patients at the UAMS Outpatient Endocrinology Clinic. 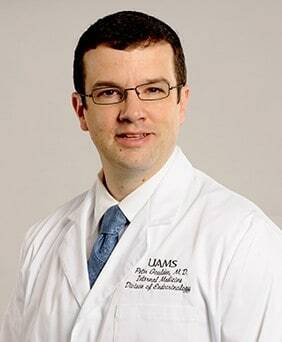 He also teaches in the UAMS College of Medicine as an assistant professor in the Department of Internal Medicine, Division of Endocrinology & Metabolism. Goulden received his medical degree in 1995 from Edinburgh University in the United Kingdom and completed a fellowship in endocrinology, diabetes and internal medicine in London. In 2011, he was made a Fellow of the Royal College of Physicians. During his tenure as a consultant in diabetes and endocrinology in West Kent, U.K., he was awarded four clinical excellence awards for clinical service development, clinical champion and clinical lead, educational commitment and research. Goulden is a member of the Endocrine Society and the American Diabetes Association.